Instagram recently introduced video sharing option using which you can share up to 15 second videos on it. If you really like some video on Instagram, you may want to download it. But there is no official procedure to download Instagram videos yet. There are some tricks to download Instagram videos but all these require installation of a software or app. Here’s a simple method using which you can download Instagram video without using any software. First, you need to open Instagram in your web browser (FireFox or Google Chrome) on your computer. Login to Instagram and open the video that you want to download. Let it load completely. Then right click on the page and click on ‘Inspect Element’ Option. A box will open at the bottom of your page. In this click on ‘Select an Element with Mouse’ option. 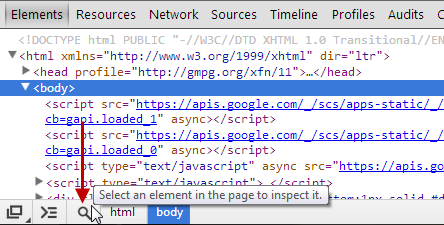 The image below shows the Select an Element with Mouse in Firefox. While the second image shows the same thing for Google Chrome. Once you click on the select element button, click on the video on the Instagram page that is already open and loaded. The code in the bottom box will instantly change to show you a link to an mp4 video. Double click on this video link, select it and copy it. Now, paste this video link in the address bar of your browser and press Enter. The Instagram video will immediately download on your computer.